Olinda, nee Schenke, Hacker, 95, of Lenzburg, IL; passed away peacefully at home on March 31, 2019. Linda was born on January 16, 1924 in New Athens, IL to the late Fred and Alma, nee Berthold, Schenke. In 1925 her family moved to Lenzburg. Linda attended Lenzburg Grade School and two years of high school, then finished her last two years at New Athens High School, graduating in 1941. She was awarded the Illinois State Teacher Scholarship and attended Southern Illinois Normal University at Carbondale, graduating in 1944 with a BS in education, her life long dream. Mrs. Hacker had a 30 year teaching career – East Dutch Hill and Risdon rural schools in New Athens from 1944 to 1949, Lenzburg Grade School from 1961 to 1964. She joined New Athens Grade School as a third grade teacher from 1964 to 1986 when she retired. Linda was a homemaker, a member of St. Peters United Church of Christ in Lenzburg, Illinois Retired Teachers Association, Major League Baseball Alumni Association, SIU Alumni Association and the Lenzburg Fireman Auxiliary. She traveled extensively all of the U.S. following her husband Warren’s Pro baseball career of 34 years. On August 1, 1946 Linda married Warren Hacker of Lenzburg on home plate in Pampa, Texas where Warren was beginning his professional baseball career. On November 4, 1950 a daughter, Pamela, was born bringing great joy. Pam married on November 24, 1973 to David Sutton making a special addition to the family. She was preceded in death by her husband Warren of 55 years, her parents, Stepmother, Ida Schenke, a brother, Elmer, and a son, David in infancy, special life long friends Ruth Schaller and Virginia Hood. Surviving are her daughter and son-in-law, Pamela and David Sutton of Lenzburg, IL. 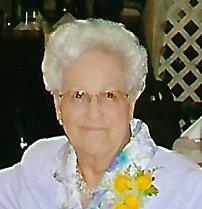 Sister-in-law, Dorothy Hacker of New Athens, IL. God child and nephew, Richard (Kathryn) Hacker of Tilden, IL and their children; Roger (Marisa) Hacker of Oakland, CA, and Scott (Jenny) Hacker of Lebanon, IL and Katy Hacker of Fairview Heights, IL Two special nieces; Ruth Ann (Jon) Hanft of New Athens, IL and Jeanne (the late Don) Jansen of Fairview Heights, IL, and their daughter; Laurie (Chad) Gray of Swansea, IL and their children, Evan, Drew, Reece, and Connor, all of Swansea, IL and special friends that were like sons, Lee and Neil Schaller. In lieu of flowers memorials may be made to St. Peters United Church of Christ, Lenzburg Fire Department or to Hospice of Southern Illinois. Visitation: Friends may call at Heil-Schuessler Funeral Home in New Athens, IL on Friday, April 5, 2019 from 4:00 p.m. to 8:00 p.m. and on Saturday, April 6, 2019 from 9:00 a.m. to 11:00 a.m.
Funeral: Services will be held at Heil-Schuessler Funeral Home in New Athens, IL on Saturday, April 6, 2019 at 11:00 a.m with Rev. Robert Coffey officiating. Burial will follow at Oakridge Cemetery in New Athens, IL. Dearest Pam and Dave, Mike and I will be thinking of you in the days ahead. We’ve never met your mom, but seems she was loved by so many. Prayers for you and your family. I’m so sad so hear of Mrs. Hacker’s passing. She was my 3rd grade teacher, I believe 1968. My sincerest condolences to her family and friends. Rest In Peace, Mrs. Hacker. Rest peacefully Mrs Hacker, you were a true gem. I loved you and Warren like an extra set of Grandparents. My memories of you both are so fond and so close to my heart. Today the world is a little less bright without you in it. My heart is broken, and I’m crying tears of joy for al the times I was lucky to share with you. I pray God has wrapped you in his arms, and that Warren met you at the Gates! I will remember you. And Love to you always! I was in her class in 1964. One of the best teachers I had! You gave me wonderful memories. Thank you. Mrs. Hacker was my first teacher at Risdon School and I loved her. She was always so kind and gentle. Prayers for her family. RIP Mrs. Hacker. She was a wonderful person and a truly great teacher. Sympathies to the family. Mrs. Hacker, you were a peach. You were a top notch teacher and a warm, kind soul. Every student you taught over your career and everyone else who simply knew you was made a better person because of your presence in our lives. You will be sorely missed.